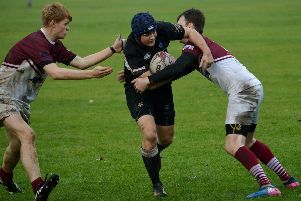 Berwick RFC moved within one point of league leaders Royal High with a 27-16 away victory over Broughton on Saturday. Broughton took the lead with a penalty on the ten minute mark and, after an opening period devoid of much scoring, Berwick levelled the scores with a penalty of their own on 24 minutes. The visitors didn’t wait about in their search for the lead, and were ahead within five minutes of being level when Gaz Hill bundled his way over to score. Andrew Skeen missed the conversion but Berwick led 8-3 after half an hour. Tommy McColl’s converted try just three minutes before the break ensured a reasonably comfortable lead for Berwick going into the break, although another penalty from Broughton meant their lead was only nine – at 6-15. It was that man again, though, that sealed the game.Just five minutes into the second period, McColl went over and another converted try had the score at 22-6, and it was looking like a comfortable afternoon for Berwick against their mid-table opponents. A Jack Dalrymple try on 51 was to be Berwick’s last of the day, as they took their foot of the gas with half an hour remaining. Connor McAndrew and Christopher Rhodes went over for the hosts, but Broughton never got themselves back within a converted try of their visitors and Berwick cruised to victory. Elsewhere, with Duns not in action for the second consecutive weekend, it was another tough result for struggling North Berwick. With two wins and six losses from their opening eight matches, North Berwick sit 12 points adrift at the foot of the table – with a point deduction not helping their cause. 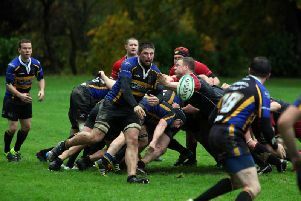 On Saturday, they were defeated 35-14 by mid-table Portobello. Elsewhere, Royal High edged past Linlithgow 48-41.